OAKLAND, CALIF., August 31, 2016. 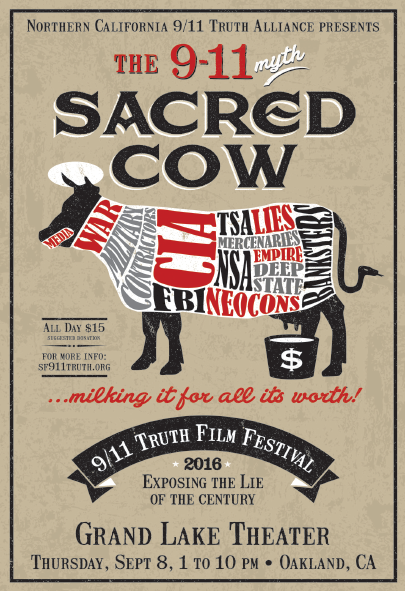 Fifteen years after 9/11, the Northern California 9/11 Truth Alliance will hold its 12th Annual 9/11 Truth Film Festival at the Grand Lake Theatre, 3200 Grand Ave., Oakland, Calif., on September 8, 2016, 1 -10 p.m., theatrically premiering documentaries from the United Kingdom, Canada, and the United States. Speakers include Graeme MacQueen, PhD, Peter Phillips, PhD, Mickey Huff, John Meaders, William Veale, and filmmakers Tony Rooke and Charles Ewing Smith.